Here is the story about my deaf girl, Mara, who rocks my world. …. While volunteering at a no-kill animal shelter 3 years ago, I immediately noticed a new arrival. The face looking up at me through her kennel was compelling. Here was a 4 year old deaf, blind in one eye, Australian Shepherd, who was also heartworm positive. After spending a little time with her at the shelter, I agreed to foster Mara while she was going through heartworm treatments. But it took no more than a couple days to know that this girl was sweet and smart— and I took the next steps to adopt her and make her a permanent part of our family! Once she was fully recovered from heartworm, we began obedience training. We worked individually with a trainer and also in group training situations at the school with other hearing dogs and their handlers. We fit right in with me using my hand signals while others used their voices. 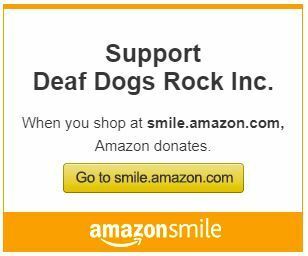 A Google search led me to the Deaf Dogs Rock community and your training tips are a great resource too. A key tip for me is that you can teach a deaf dog any hand signal and its meaning (I’ve even made up a few of my own), as long as you are patient, consistent, and use positive reinforcement. Through the course of training, I could tell Mara was calm and relaxed in many situations…including with other dogs, with kids and other people. So I decided to pursue Therapy Dog training. At the end of that course Mara passed her Canine Good Citizen(CGC.) Subsequently, we visited hospice patients in long-term care facilities. Last fall the Animal Assisted Therapy program at our local hospital (Northwest Community Healthcare) was looking for additional dog teams to join their program. We passed the screening test and went on to complete the required additional training. We are now registered with the Alliance of Therapy Dogs. We are proud to be one of the many dog teams that visit patients on a daily basis throughout the hospital complex, including the mental health facility, and satellite offices; providing some relief from stress, pain, and anxiety for patients— and staff alike! Like all dogs, Mara loves to relax and hang out with the family. A perfect example is her enjoying a boat with her “sister” Honey while on a family vacation. Whether at work or at play, my girl Mara is a very special dog. She totally rocks!